It’s time for some change. I have baked quite a few desserts in the past few weeks and wanted to cook something which is as interesting and which we don’t eat very frequently and is not a dessert. Middle eastern food pops up. When I think middle eastern food, first few things that comes to mind are Pita Bread, Beetroot Hummus or Pumpkin Hummus, Baba Ganoush and Falafel. I made a traditional Middle Eastern dish for today’s lunch and everyone loved it. Pita bread is an integral part of the Middle Eastern cuisine and can be stuffed with array of ingredients to make a Falafel or can be eaten as such with any kind of dip. The key to make a good Pita is to bake it at a very high temperature, so that it puffs up immediately leaving a pocket in between. As the bread cool and flattens, a pocket is left in the middle and this gives it a great texture and taste. I was first introduced to hummus by one of Mohit’s bua (aunt)who lived in UAE for sometime. She got me a big container of the dip and I managed to finish it alone in a few hours of time. I was in love with the dip and always wanted to recreate it. She even gave me the recipe to make it, but unfortunately I don’t have it right now as we are traveling and it’s very difficult to carry all my collection. I surfed the net and decided on a recipe from http://www.sweetannas.com. I did a few changes to the original recipe and made my own Tahini from scratch. Hummus came out very good. It was way better than the store bought one. Baba Ganoush is a Lebanese dish of aubergine mashed and mixed with virgin olive oil and other seasnings. Whether you know it as Mutabbal, Moutabal, caviar’d aubergines or baba ganoush, the smoky aubergine puree is a classic. Like its cousin Hummus, baba ganoush is readily available at a lot of grocery stores. But nothing can beat a home made stuff. It’s basically hummus in which chickpeas are replaced with smoked aubergine. Pita bread and the dips look finger licking good. what a mouth watering combo!! I am trying that pita bread.! Didn’t know it was so easy.. They have a perfect pocket! 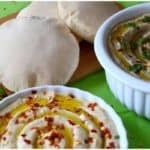 Pita and hummus had been in my to do list for a long time.. Time to get it into my done list.. bookmarked your page for tips!! Lovely bread, puffed so well and perfect clicks!! Looks perfect and lovely clicks. Beautiful clicks.. and those pita breads came out so perfect! Awesome pictures… I’m sure it tasted awesome too. Baba Ganoush has been on my list for a while now. I could try this recipe. What a colourful dish! Love the presentation, dear! Fantastic cliks!! !And this makes a delicious & memorable lebanese meal!! Lovely and same pinch. I to tried pita bread last weekend. 🙂 but I prepared for orange and carrot salad. I love this hummus and will try next time for sure when I prepare pita. wow, lovely clicks and recipes dear..just awesome..
beautiful clicks!! i never new dat pita breads can be made so easily at home…wow glad to follow you!!! Wow! You are a brilliant baker, your pittas are baked to perfection and the dips are amazing. Very well presented, I’m totally loving this. Awesome Recipe dear.Luv this hummus with a variation. First time here – loving the post. I love Middle Eastern food and your dips look delicious. mumma saying thnx 4 mentioning her name.. I do make the dips very often, but am surely going to try out the pita bread. My kids really the Khubz that they used to have with these dips when they were in U A E.
I add a little yogurt and about half the quantity of Lemon to my dips.